Libvirt is collection of software that provides a convenient way to manage virtual machines and other virtualization functionality, such as storage and network interface management. a command line utility (virsh). 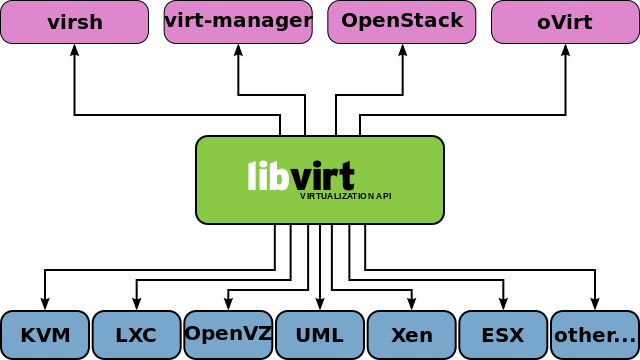 An primary goal of libvirt is to provide a single way to manage multiple different virtualization providers/hypervisors. No need to learn the hypervisor specific tools. Various domain lifecycle operations such as start, stop, pause, save, restore, and migrate. Hotplug operations for many device types including disk and network interfaces, memory, and cpus. Forcefully stop a given network. KVM (Kernel-based Virtual Machine) is a full virtualization solution for Linux containing virtualization extensions (Intel VT or AMD-V). a loadable kernel module, kvm.ko, that provides the core virtualization infrastructure. a processor specific module, kvm-intel.ko or kvm-amd.ko. KVM does not support paravirtualization for CPU but may support paravirtualization for device drivers to improve I/O performance. QEMU uses emulation; KVM uses processor extensions (HVM) for virtualization. The program will first determine if /proc/cpuinfo contains the flags indicating that the CPU has the Virtualization Technology (VT) capability. Next, it will check if the /dev/kvm device exists. "vmx" stands for Virtual Machine Extensions, which adds ten new instructions, These instructions permit entering and exiting a virtual execution mode where the guest OS perceives itself as running with full privilege (ring 0), but the host OS remains protected. KVM (Kernel Virtual Machine) is a Linux kernel module that allows a user space program to utilize the hardware virtualization features of various processors. Today, it supports recent Intel and AMD processors (x86 and x86_64), PPC 440, PPC 970, S/390, ARM (Cortex A15, AArch64), and MIPS32 processors. QEMU can make use of KVM when running a target architecture that is the same as the host architecture. For instance, when running qemu-system-x86 on an x86 compatible processor, you can take advantage of the KVM acceleration - giving you benefit for your host and your guest system. The KVM project used to maintain a fork of QEMU called qemu-kvm. All feature differences have been merged into QEMU upstream and the development of the fork suspended. To use KVM pass --enable-kvm to QEMU.